Little Known Fact.. 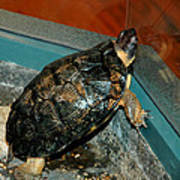 The rigid shell means turtles cannot breathe as other reptiles do, by changing the volume of their chest cavity via expansion and contraction of the ribs. Instead, turtles breathe in two ways. First, they employ buccal pumping, pulling air into their mouth, then pushing it into the lungs via oscillations of the floor of the throat. Secondly, by contracting the abdominal muscles that cover the posterior opening of the shell, the internal volume of the shell increases, drawing air into the lungs, allowing these muscles to function in much the same way as the mammalian diaphragm. 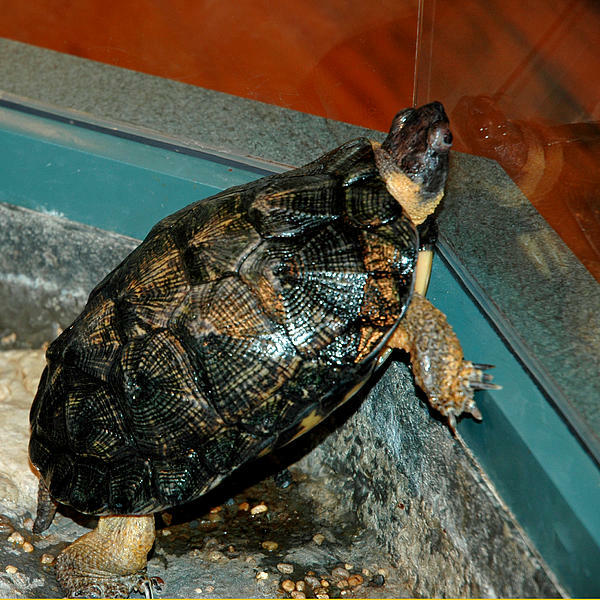 Turtle reflects on what life would be like on the other side of the glass. Stoney Creek Metro Park, Michigan According to the oral stories and traditions of the Great Lakes Woodland Indians, the turtle is a powerful symbol. One legend details how the turtle's back provided a base for the first land that was formed in the midst of the great waters. Mackinac Island takes its name from a word in the Ottawa language meaning "Great turtle". Even today, turtles hold power and meaning in our lives. 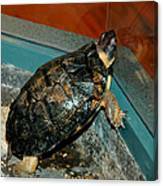 Turtles are an important link in the web of our living planet and it is up to everyone to ensure they remain.